Many companies believe that increasing the number of double seam measurements is the best solution in ensuring their seams are hermetically vacuum sealed. Increasing the rate and number of double seam measurements is not the solution. After all, checking more cans won’t improve production, it will just locate problems more frequently – without improving a single can. That’s why advanced, high accuracy, fast and repeatable seam scopes are needed now more than ever. Now with SEAM doctor to help analyze and solve seaming issues discovered through the software! 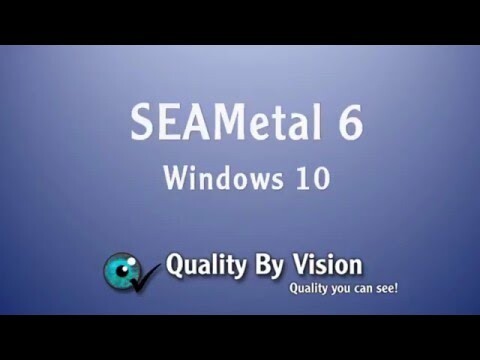 SEAMetal HD is the third generation of double seam vision systems by Quality By Vision. Quality By Vision has been continuously improving and developing this system since 1993, ever since the world’s first automatic double seam scope: SEAMetal 9000X has been introduced. Contrary to some statements by competitors, Quality By Vision were also the first to introduce the fully automatic robotic system for double seam inspection in late 2003. Our SEAMetal HD double seam software is easy to learn and the most user-friendly in the industry. Fifteen years of continual improvements have allowed us to introduce the first integrated High-Definition sensor for double seam inspection. This provides an unprecedented look at the double seam. You can now get a sharper, clearer image which in turn gives a much more accurate and repeatable measurement! The system runs under Windows operating systems (including Windows 10) and connects to the computer using USB 2 (or higher). In third party customer GR&R testing, this system was found to have “world class” GR&R rating! The software measures: Body thickness, Cover thickness, Seam thickness, Seam length (seam height), Body Hook, Cover Hook, Wrinkle (Tightness), Seam Gap, Countersink, Body Hook Butting, Cover Hook Butting, Overlap, Overlap %, (Countersink – Length), Vee, and many more. The software also allows for 5 standards (including minimum, maximum, nominal and amber = Unacceptable minimum and maximum). Each measurement can be made from the high definition sensor, by keyboard, or imported from an external mechanical gauge. The software provides easy to understand and free SPC statistics graphs. Statistics calculations include: Average, standard deviation, six sigma graphs, CP, CPK, Kurtosis, Skewness as well as UCL and LCL. The software is touch friendly, you can zoom, pan, move lines with a simple gesture. The software will let you customize reports, including attaching SPC graphs and seam images to your reports. Everything you need is in one simple package! True thickness option for accurate seam thickness, without requiring external calipers or gauges! NEW – Competitive upgrades for seam inspection systems from other manufacturers! Adapts to your screen resolution, particularly with high resolution screens! XD mode (switch between gauge and non gauge).